Send Pink Rose Heart to Chennai. Gifts to Chennai. Send Flowers to Chennai. Description : Roses are all about love. They help in expressing unexpressed words. 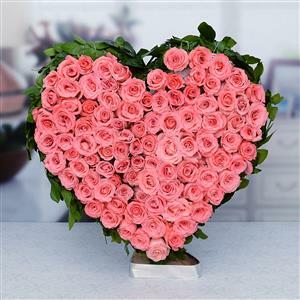 A special assortment of 100 pink Roses in a heart shaped arrangement, make life appear compelete. Speak your heart with roses.A special gift for someone special in Chennai. You can also send other Gifts to Chennai through Gift2Chennai.com.